Andrea Curl Mega Flare Individuals Combo Pack are high-quality thicker, ultra wide individuals criss-cross to use to easily customize and accent every eye shape and color and design for fuller, more dramatic lashes. Add extra flare & volume with added wispy effect. 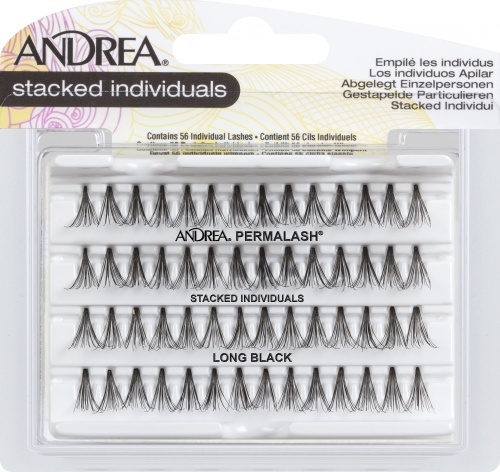 Andrea Permalash (Perma-Lash or also known as Andrea Individual Lashes) Naturals LONG Pack helps create full, natural-looking lash styles. Great to add lengths to the outer lash corners for flirty look. 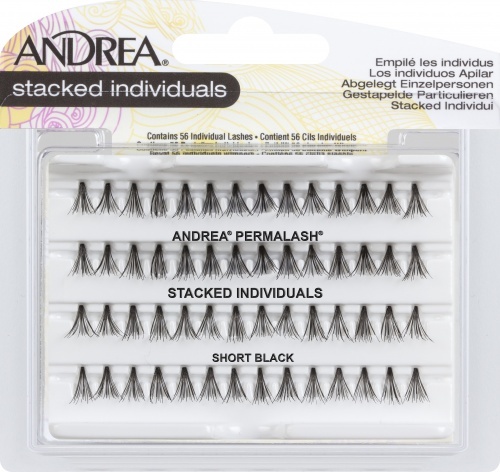 Andrea Permalash (Perma-Lash or also known as Andrea Individual Lashes) Naturals SHORT Pack helps create full, natural-looking, subtle lash styles. Andrea Permalash (Perma-Lash or also known as Andrea Individual Lashes) Naturals COMBO Pack Black are Knot free and contain 3 sizes of individual lash clusters--Short, Medium and Long individual lash clusters--to helps create full, natural-looking, subtle lash styles. Andrea PermaLash Adhesive (also known as Andrea Eyelash Adhesive for Individual Lashes 0.125 oz) is specially formulated to hold individual lashes securely and comfortably, day after day. With twice the amount of lash volume, Andrea Stacked Individuals Long contain 20 strands per individual compared to 10 strands in the regular knot-free naturals. Twice the Volume, Twice the Drama! With twice the amount of lash volume, Andrea Stacked Individuals Medium contain 20 strands per individual compared to 10 strands in the regular knot-free naturals. With twice the amount of lash volume, Andrea Stacked Individuals Short contain 20 strands per individual compared to 10 strands in the regular knot-free naturals.